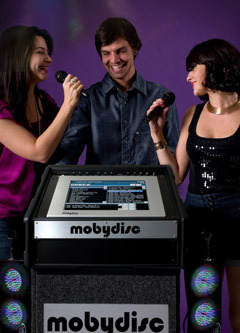 Hire the perfect solution for functions where you don't need a mobile DJ and get the same high quality music system and huge song selection that made Mobydisc famous. Now and for a limited time only every hire of a Jukebox comes with a free Karaoke option! Grab the mike and get the guests involved with a wide range of popular backing tracks and the lyrics displayed full screen. Everything about the service was great. We’ve hired Mobydisc several times and it’s always value for money and makes the evening: See you next time. We had a very good evening thanks to the Jukebox. The price point made it the perfect choice for our function, and with thousands of songs to choose from no one was left out. Ring us today for our special free Karaoke offer on 1 800 100 606 or submit an online quote.